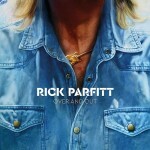 Share the post "Album review: RICK PARFITT – Over And Out"
Rick Parfitt gave almost 50 years of his life to Status Quo and his passing in December 2016 was felt keenly both within and beyond the world of entertainment. Quo are a household name and Parfitt, alongside Rossi, was the band’s driving force and public face. In all those years, Parfitt had never released any solo material. One had been recorded back in 1985, due to be called ‘Recorded Delivery’. It featured the future Quo rhythm section of bass player John “Rhino” Edwards and drummer Jeff Rich. But the album never saw the light of day. It seems that Parfitt recorded another, unknown to almost everyone, in Turkey in June 2016 whilst recovering from a heart attack. After his demise, further musicians were drafted in to complete the record. This included Queen’s Brian May, Muse bassist Chris Wolstenholme, Rick Parfitt Jnr, “Rhino” Edwards (again) and Alan Lancaster. And so, 52 years after the start of Rick Parfitt’s musical career, and 15 months after his death, we receive his debut solo album. It has been a long wait. Whilst the collection shows off the more crafted and mellow side of Parfitt’s talents, there is plenty of boogie and groove to satisfy fans of the band’s glory years as well. Album opener, ‘Twinkletoes’ is a fair benchmark for the material. It’s a melodic rocker with catchy chorus, layered up vocals and neat arrangements. Brian May pitches up on this one to offer a few fine flourishes on the lead breaks. However, ‘Lonesone Road’ and later ‘Fight For Every Heartbeat’ both offer something more substantial. The former finds a mark much closer to the pure Quo sound of their mid 70’s output. The boogie infused track changes up into a proper old swaggering foot-stomper with about a minute left on the clock. Likewise, ’Fight For Every Heartbeat’ is a stripped back rocker. The gorgeous riff jumps straight from the gatefold-sleeve era of something like ‘On The Level’. Hints of honky-tonk piano keep the rock ‘n’ roll rumbling. And that crystal-clear guitar solo could be Snowy White, circa ‘Bird of Paradise’. In recent times Parfitt has contributed less regularly as a writer to the Quo canon. So it’s interesting that the best of the tracks here hark back in style to Quo’s best Parfitt-penned cuts like ‘Whatever You Want’, ‘Mystery Song’ and ‘Rain’. Whether Parfitt knew the end was near or whether ‘Over And Out’ just captures a reflective moment is a moot point. There is no doubt, however, that these haunting lyrics about the end of the road chime with the hallow clang of his own epitaph. “The signal’s gone weak/it’s all looking bleak” – sentiments almost too raw and tender to bear in the same way Freddie Mercury opened up on ‘These Are the Days of Our Lives’. The voice seems more fragile than elsewhere on the album. The track was played at Rick’s funeral. It must have split the mourners wide open. Poignant does not come close. The melodic moments return with ‘When I was Falling in Love’ which carries a flavour of Roy Orbison in the vocal phrasing. ‘Without You’ is the album’s lead track. An odd choice really, because Parfitt takes on an unexpected falsetto for the first half of the song which, to be fair, he only just about gets away with. The rest of the track builds nicely around a ballad written for his son, flowing on sweeping strings and swelling backing vocals. A brace of rockers follow. ‘Long Distance Love’ has a tight, choppy riff, cut under a driving drum track. Nice, tidy guitar solo from Rick. Then ‘Everybody Knows How To Fly’ smashes in on a typical three-chord blues boogie. Harmonica fills out the stomp for good measure, just in case you thought there wasn’t enough swing kicking off. Loads of dirty slide crawling all over the chorus. If some of the material on this album strikes a sentimental tone, this is offers a counterpoint through an uplifting, optimistic lyric. And Parfitt’s vocals are excellent. Next up, ‘Lock Myself Away’ is a lovely little 50’s inspired rock ‘n’ roll ditty: snapped drums, tinkled ivories and doo-wopped backing vocals. A simple joy. The album closer is an old song. A version of ’Halloween’ appeared on a Quo b-side ‘Who Gets The Love’ in 1988. It’s the most complex track here and has keyboards to the fore, notably a snaking bass synth, together with the odd pained vocal and a harder guitar sound than anywhere else. There’s a vaguely spooky feel to the track and it doesn’t quite fit the template of the album. This entry was posted in ALBUM REVIEWS, ALBUM REVIEWS (Mobile), All Posts and tagged album, Brian May, Chris Wolstenholme, John 'Rhino' Edwards, Over and Out, review, Rick Parfitt, Status Quo. Bookmark the permalink.